Typical doctors office, we have a 9:30a appointment and don't go back for almost an hour. Once in the back, they check to see which is my dominate eye (right) and give me a Valium. 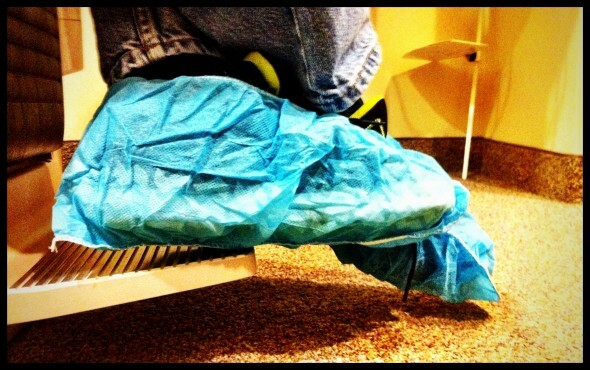 They proceed to put me in a hair net and place booties over my shoes. My forehead gets a sticker saying which type of surgery I'm having and in which eyes (custom, bladeless, both eyes). The surgeon then stops by to introduce himself and have one last look at my eyes in the microscope. He then walks me through the procedure and lets me know what he'll be asking me to do. After that, it's game time. We get escorted to the surgical suite. Aly has a seat outside the window with a monitor that lets her watch what's going on. I'm brought into the darkened suite and laid down on the reclined chair. Several times I'm asked about my name and birthdate and they make sure it matches up with the name tag I'm wearing on my head. I suppose this is to make sure they have the proper settings loaded into the computers based on the tests they've previously run on me. Left eye first. Numbing drops are placed in both eyes. A patch is placed over my right eye and a suction device is placed on my left. This suction device is cone shaped and makes my eyeball firm so the laser can cut the flap in my cornea. When the suction is turned on my vision goes blank. I get swiveled under the flap making machine and the surgeon says that they've lost suction. Out I go. They place the device on my left eye again and swivel me back into place and this time we still lose suction. The surgeon tells me that my eye muscles are very strong, most people can't move their eye at all when the suction is on. They place a colored sticker under the laser and remove the patch on my right eye. They swivel me back in place and tell me to watch that sticker with my right eye because they think small movements in that eye may be making my left eye move around too much. No suction. Again for the third time I've moved my eye too much. I don't think I've moved it at all. The surgeon calls for a change-up and they give me some more numbing drops and move to do my right eye this time. No problems. The laser takes about 15 seconds to cut a flap. It was pointed out to me that the first eye should have been that simple too. So, it's time to do the left eye again and now there are no problems. I get swung over to the laser on my right which will shape my eyeball into the proper curve needed to correct for my nearsightedness and the tiny amount of astigmatism I've developed. The doctor flips my flap open, I can clearly see this happening as he reaches in with his little tools and my vision gets super blurry. Once under the laser, I'm told to watch the extremely out-of-focus blinking red dot and about 23 seconds later (the nurse is counting down) that eye is done. As the laser is altering the surface, I can see the red dot change and get a little clearer. After swiveling me out from under the laser, the surgeon flips my flap back into place and squeegees it smooth. At this point I can tell that, even though my vision is fuzzy from all the drops I can see the ceiling tiles. Left eye next. No problems. Squeegee it back into place. I'm assisted up and walked over to a microscope where the surgeon examines my eye and says the flap looks fine. I tell the surgeon that this has to be the weirdest thing that I'll ever have done to me. I'm given some wrap-around sunglasses and escorted out the door where Aly meets me.